Jon Jones had a lot riding on his performance at UFC 152, and some might have considered it the biggest moment of his career. While the stakes of the fight on paper certainly didn’t seem as high as when Jones first fought for the UFC light heavyweight title or when he went on a streak of three wins over three former champions, the adversity that led to UFC 152 put a giant target on his back like never before. Jones turned down a short notice replacement fight at UFC 151 just a few weeks back, and after the event was cancelled insults were hurled at the champion calling him ‘selfish’ and words like ‘disgusting’ were used by UFC President Dana White when describing his decision. So even though Jones was facing middleweight Vitor Belfort on 3 weeks notice, the pressure was at an all time high for the best 205lb fighter on the planet. Leading up to Saturday night, Jones talked at length in interviews about his ‘brand’ and maintaining his legacy, but the house of cards almost came tumbling down in rapid fashion just moments into the opening round. Jones secured a takedown to put Belfort on his back, but before he could blink the long time Brazilian Jiu-Jitsu black belt had his legs swiveled up around his opponent’s head, locking out a straight armbar from the bottom. Belfort extended his hips to put pressure on Jones’ elbow, and for a few seconds it looked like the fans in attendance in Toronto were about to witness one of the greatest upsets in UFC history. The only problem was Jon Jones had no intention of tapping out to the submission. “He got that armbar in every way, shape and form. I’ve never had my arm pop like that before, I felt it, but I worked too hard to give up. 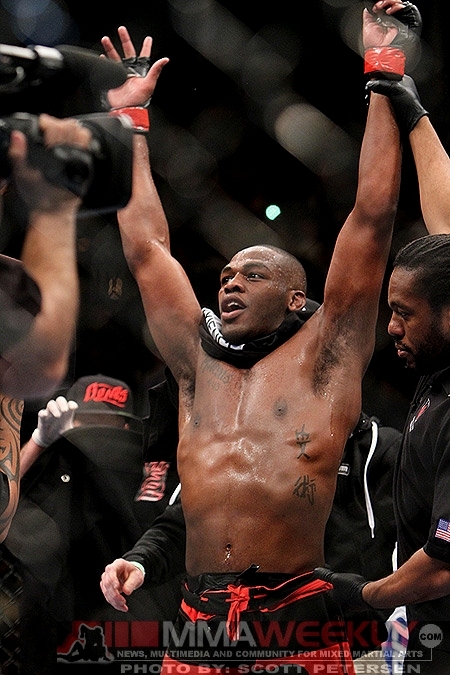 I honestly was waiting for it to break, I was not going to tap out,” Jones said. As it turns out the submission was the one shining moment for Belfort in a fight that would last for almost another 15 minutes with Jones dominating almost every second. Jones blasted away at Belfort’s front leg with a damaging sidekick that punished the thigh and knee of the veteran Brazilian. Time and time again, Belfort would get stuck in the clinch with Jones and on several occasions he actually pulled guard, much to the amazement of everyone watching in the arena and at home. Following the bout, Belfort explained that he suffered a rib injury in training that hampered his movement, and pulling guard was his way of getting air back in his lungs and stopping Jones’ attacks. “He caught me with a kick to the rib and I already had an injury in training, so I was trying to work my jiu-jitsu, trying to catch a breath. He was long and he moved his pace pretty well. That’s why he is the champion,” Belfort stated. Jones dropped Belfort in the third stanza with a sidekick to the body, but couldn’t quite put him away despite his best effort. The finish came in the fourth round instead. The champion quickly swept Belfort to the ground and moved into side control, trapping the Brazilian’s arm under his leg and looked to bludgeon his opponent with a devastating series of elbows. Belfort slipped clear of the damage, but quickly Jones transitioned to an Americana/keylock and wrenched up on the hold, bending his opponent’s arm in a direction it had no business going. As the vice-like grip tightened, Belfort had no choice but to tap and give Jones his fourth consecutive title defense victory. The win followed weeks of scrutiny and a very tumultuous time for Jones, but the end result was still a victory, and he promises that he’s going to come out on the other side of this situation a better fighter and a better man. “I really feel like a stronger young man standing here before you guys today,” Jones stated. The next move inside the Octagon for Jones remains a mystery, but instead of an opponent, the champion will likely visit a doctor to see if there was any serious damage done to his arm from Belfort’s submission attempt.